Great news from The Official Page for LazyTown: A new Stephanie has been chosen and filming of new episodes started yesterday (Monday, April 30, 2012)!! Reports are the first day of shooting went great. Don't know about you guys, but I can't wait for the new season!! I didn't even know they were planning a new season, much less starting to film it!! Wow, I've spend too much time away from this fandom. The new Steph seems absolutely adorable. I guess it's going to be strange not seeing Julianna in the pink wig and dress, hahaha, but Chloe has the same sweet smile and kind eyes that Julianna when she was a kid. Chloe has modeled for me many times. She's a terrific kid and I have no doubt she'll do a great job on the show! Just learned about the new episodes. And while I think that's super-awesome news I can't help but wish they didn't replace Stephanie. I think they should have brought in a second niece or something. 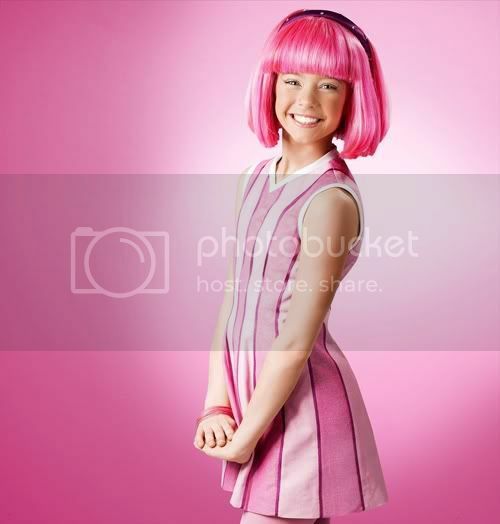 Nobody but Julianna can be Stephanie of Lazytown. Chloe could have played in a different colored wig and been NOT Stephanie. A direct copy of Stephanie I think is not the greatest idea. She looks nothing like stephanie, her acting is sub par and its just NOT RIGHT. She could have been in a blue wig or a purple wig and been a sister or something. Is it true that Stefan will no longer be in the production? I'm fairly sure he's still in the show, but I could be wrong. I guess we'll have to wait for more news! Not to knock the " new " Stephanie but She's no Julianna. Her dancing lacks the enthusiasm that Julianna had. She made the show. I can't stand the new Stephanie. Something about her smile is irritating. Will not be watching any lazy towns unless they are reruns. Poor casting. Such a disappointment. This new girl has nothing on Juliana.. They certainly should have made her a new character instead of trying to have a cheap Steph knock off!! Lol. Juliana really had a special something, and I wish the best for her!! Just too bad the producers thought this would work without her... She made the show. I don't think children would really understand they're beloved Stephanie just leaving with no warning. I don't agree that Julianna made the show; there's a lot to the show, and though she was a special part of it, I still think it can work with Chloe (and does appear to be!). I saw the new one and I was like what wheres stephanie yes she not here anymore but we gotta give chloe a chance she wasnt bad at all. I will always miss the old stephanie but atleast the show is back with NEW episodes im still excited so good lick chloe you'll be great. So why was the old Steph replaced? Just curious. My five year old hasn't even noticed that Stephanie has change!